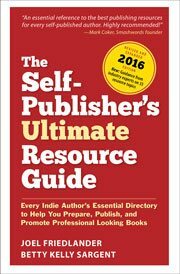 It’s essential for self-publishers to come to grips with the way that discounts are handled in retail publishing. If you plan to publish a book that will be sold within the retail book distribution system you’ll need to understand how discounts work. Even if you plan to sell your books through online retailers, you’ll still need to set a discount. But before we get into discounts themselves, let’s back up a moment. It would be impractical for manufacturers of products to be the only source for the average person to buy those products. So we have a multi-tiered manufacturing and distribution system. Manufacturers set the price they think the product should sell for, then offer it at a discount to retailers willing to sell to their own universe of buyers. Manufacturers can make these arrangements with hundreds or thousands of retailers, trading the discount to acquire a means for their customers to easily buy their products. But even this isn’t efficient enough. Manufacturers don’t want to deal with thousands of retailers, so they rely on distributors to cater to the retailers. This inserts another tier into the system. Distributors aggregate the needs of wholesalers, adding another layer. Wholesalers cater to networks of retailers on geographic or demographic lines, making it easier for the manufacturer to extend their reach. Of course, this is business, so every tier in this distribution cake has to make a profit. And all those profits are subtracted from the retail price, the actual price the customer will pay at the register or in their shopping cart. Back to books. In this equation you, as the self-publisher, are the manufacturer. You set the retail price of the book, and you have to accommodate all the levels of distribution that you’ll need. The total discounts from all levels that you might have to give up can go as high as 70% of the retail price. Your $10 paperback may yield you only $3 in gross profit, at the extreme. Let’s start at the end of the chain. The normal discount that retailers require is 40% of the list price, or a 40% discount. This is the minimum, and it can go higher. These books also need to be returnable. This is a quaint carryover from an earlier era in publishing which, in effect, makes most bookstores into consignment shops. The bookstore pays the wholesaler $6 for the book it will sell to a customer in their store for $10. There are many wholesalers, although Ingram and Baker & Taylor are the largest. There are many other regional or specialty wholesalers as well. For the wholesaler to be able to give the retailer the 40% discount he needs, the wholesaler has to receive a higher discount, often 55%. Wholesalers are simply aggregators. They make no effort to market the books they carry, they simply make them available for purchase. The wholesaler pays the distributor $4.50 for the book it will sell to the retailer for $6. Its margin is 15%. The distributor has a relationship with its publishers that’s fundamentally different. Distributors, with many publishers to represent, can afford to promote a catalog of books and to sell directly through sales reps to the stores that will be establishing the market for the book. Distributors usually demand an exclusive contract with their publishers and, as a publisher you will have to give up 65-70% of the retail price to get the benefits of full distribution. In other words, the distributor will be paying you $3.00-$3.50 for the book it will sell to wholesalers for $4.50. Their margin is 10-15%. How Will You Decide on Your Discount? As if that wasn’t complicated enough, since you’re the publisher you’re going to be asked to set your discounts, sometimes a confusing array of discounts. But you’re still not ready to address this question. I’ve often talked about being clear on your publishing and book marketing strategy before embarking on a publication. There are so many decisions that are influenced by the course you set for your book publishing project. More and more self-publishers are printing digitally and using print-on-demand distribution. Part of the problem we have with discounts is the tension between this new model of bookselling and the traditional model I’ve outlined above. They are clearly inconsistent, yet every publisher is forced to establish a discount schedule for the entire industry. But you don’t have to worry about that, you’ve probably only got the one book. What should you do? Before you set your discount to 55% sit down and write out your plan for creating demand for your book at the bookstore end of the chain. How do you plan to do that? If you set your discount to the lowest allowable by your particular publishing scenario, no bookstores will buy your books, but you will make the most out of every online sale you possibly can. Years ago, when I had a small publishing company I had a distributor, sold through the big wholesalers and did business with lots of book stores. Let me tell you, it’s a lot of time and overhead for a solo entrepreneur or even a small publisher. I think that’s why more people have decided that it’s a lot more profitable to spend your time marketing your book and driving sales to online locations, not bookstores who will just return the unsold copies anyway. Obviously there are publishers who don’t fit this mold. If you publish lavish color coffee-table books, you need a different business model. If you have a specialty market that you sell directly to, you won’t need this model. If you have your own large direct mail or email list, you probably don’t need this distribution model. But it makes sense for a lot of general nonfiction publishers. When you realize how easy it is now to get into print, and you realize that print-on-demand has neutralized a good deal of the risk of publishing new books, you want to make use of this new way of selling books even if it means forgoing the bookstores. There are other wrinkles that have been introduced to the neat fabric of the distribution picture described above. The proliferation of author-services companies like Lulu and CreateSpace and smaller players has introduced different models into the picture. There are all kinds of “deals” and “packages” that seem to change monthly, with different distribution options at various costs. As the retail bookselling business continues to suffer from the wrenching forces of technological change and severe economic pressure, we can be pretty sure the old models of distribution will begin to change. How long that will take is anyone’s guess. In the meantime, we’ll continue to deal with the distribution system we have, knowing it may be on its last legs. Takeaway: The traditional model of publishing dictates the amount of discount a publisher must give, but these models may be on their last legs. Has anything changed? Is this article still correct? Are there new facts, insights, updates, that would impact the takeaway of this article? I’ve written a book and am trying to determine what kind of discounts I should be giving in 2017. Some time in the new year I expect to publish, as POD, in a specialty market: local railroad history (nonfiction). The retail marketplace for this type of book consists of (1) a handful of relatively-small, family-run, online and mail-order railroad specialty booksellers, (2) a small number of local bookstores that maintain a local interest section, and (3) Amazon and Barnes & Noble online. This is not popular fiction, there will not be quick turnover, and my impression is that the first two retail markets know this and maintain a small inventory until they’re eventually sold (and then order more). Is my impression correct? If so, I would think I need not make the book returnable. How much of a discount do these first two retail markets expect: 40 percent? Would be improper to ask them directly how much of a discount they expect? Thanks for all the great information on this website. How did this turn out? Did the distribution company help? Did you negotiate the 60-percent (which seems really high to me)? If you would be so kind as to share your experience, I think this would be a great lesson for those of us navigating these waters for the first time. I (author & publisher) just sold 3 copies of my book to a bookstore, with the usual 40% discount. Media rate postage was $3.25…which I didn’t charge the vendor. Who normally pays for shipping…publisher or vendor? Congrats on the sale. For this kind of transaction you as publisher will be expected to pay the shipping. I am about to set prices and discounts at IngramSpark. I am setting discounts at 55% but I wonder about foreign bookstores such as in the UK. Europe and Australia. Do you recommend 55% there also or go to 40%. Great website. I have a paperback at a cover price of $14.95 through Createspace. A book club has asked to purchase a supply for a discount. I am not sure what a good discount would be so that it’s attractive, yet it doesn’t put me in the red. Any advice? Not sure what the industry standard is for something like this. The cost of printing a copy is about $4.71 (not including shipping). Thanks in advance. George, when I’ve sold books to book clubs, they usually demand a deep discount. Start at 50%, cash sale, and no returns and see what they say. Is there a minimum quantity for this discount? Is there a standard, industry accepted discount — perhaps graduated based on quantity — for institutional buyers? Does it change based on for-profit vs. non-profit status of the organization. I have a query from a religious organization. Alden, as the publisher it’s up to you to set these discounts and quantities. When selling to book clubs, large non-bookstore discount stores, religious organizations, you can set a minimum of 10 books, or a case of books (what comes from your printer in 1 carton, so you don’t have to break them open and repack them). Bernie, it they are a wholesaler they are likely to be looking for 55%, you should be able to sell to retailers at 40%. Thank you so much for all your good info. I have a very specialty market, which I can reach preety well.as I am printing and plan to sell a full color illustrated Jewish Passover Haggadah. I have the marketing in place and a very dedicated on line following, but,,,, I need more info on how to handle the keeping track of the sales and the interaction of all the emails, and gmail and yahoo and an e commerce book store. Where can I find that? Please? It sounds like you are looking for accounting or bookkeeping help, Sali. You could use a spreadsheet, or a program like QuickBooks. Thanks. It is more than the bookkeeping, it is keeping track of all the emails and responses. I think I might need some CRM software, but they seem to be aimed at much bigger operations than I am, and there are a lot of them to sort through. I don’t know QuickBooks, but I live and must do books in Israel, so I don’t think it will help. I sure do appreciate your quick response. I have gained a really lot from your site and newsletter. p.s. am tempted to set the discount to LS to figure to be exactly the profit i get through amazon sales now, which would be setting about a 35% discount, but i don’t think it’s very logical to try to match the profit i get through amazon. 2) University libraries – ok, so they won’t order unless its in the baker and taylor listing, which im in the process of setting up throughlightning source- but what do I do about discounts here? Am talking by the way as to what discount I should select for lightening source. the book is already available on amazon thru create space and i’m now also reprinting it with lightening source. your wisdom would be most appreicated! Sammi, I would go with the 50% discount to make sure your book is attractive to the markets you’re trying to reach, it will pay off in the end. Thanks for the unusually clear explanation of this byzantine pricing practice. My wife and I have started a private publishing business, but we’re increasingly being asked by our authors to put their books up for sale. Am I right that even at a 20% discount, once a book is in the database bookstores would still order the book when asked for it by a customer? Bookstores by and large are not going to order books from micropublishers at 20% discount. If a customer specifically requests a book, they have to have it available from their normal ordering sources. And you don’t want them ordering directly from you, which they are unlikely to do anyway. Rather than dealing with bookstores, you might consider either listing them on Amazon or setting up your own ecommerce book store on your (lovely) website. I forgot to mention that we’re planning on using Lightning Source for this kind of distribution, so at least we’d be in the bookstore database should a friend or relative of the author want to order it that way. Thanks again for a great blog (and you’re nice comments about the website). That’s interesting, Fred. Since I imagine many of your books will be heavily illustrated, I thought you might be printing offset. Certainly LSI will supply the info on your book to the Ingram feed, which is picked up by all the major retailers. But bookstores don’t particularly like PoD books, and don’t buy books at 20% discount. It would only be special orders, but if they can find the book through Ingram they should be able to order it. As a new publisher getting ready to release our first book discount and sales channels have been on our mind over the last couple months. We’re going with the 20% discount option which gets us listed in everyone’s database and still let’s us pay our enough so that they don’t have to live on macaroni and cheese for doing what they love. Ian, since you are experienced at online marketing, it just makes sense to concentrate on direct sales and those you can drive through online merchants. As I explained, in this scenario there’s really no reason to give up more than 20% for the listing and fulfillment that the retailers will provide. Good luck with Sweetscribe, it looks an interesting project, and I think your book bloggers network is a neat idea. Thanks for stopping by. Self-pubbing newbies often confuse the discount percentage given to booksellers (called gross markup in other kinds of retailing) with discounts offered to retail customers. The standard discount offered to Amazon is 20%, but Amazon frequently offers shoppers a 10% discount off the cover price. My new book has a $15.95 cover price, and Amazon is selling it for $14.35 — giving up a big chunk of profit. Some newbies think that Amazon will treat them better if they offer 25 or 30% discounts, but I’ve seen no evidence to support that. Self-pubbers should keep in mind that even when booksellers sell below the cover price — or even sell below their wholesale cost — the publisher still gets the expected number of dollars per book. And the lower retail price should mean greater sales and total revenue. Thanks for the detail, Michael and for making this sometimes confusing area more clear to other readers.